View towards Kullen from a garden terrace with statues (Marienlyst? ), n.d.
Oil on canvas, 25,5 x 27 cm. Skovgaard came across this evocative scene on one of his trips along the coast of Northern Zealand. 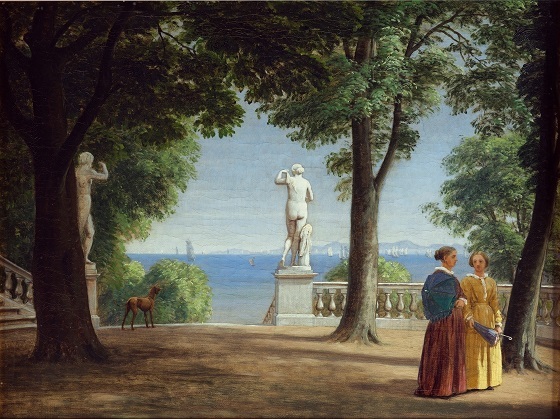 The subject is from the region around Marienlyst, depicting a garden terrace situated on some high vantage point from whence one could see both Kattegat and the Swedish peninsula Kullaberg. In the foreground, two ladies with umbrellas are out for a stroll, while a hunting dog is looking at something in the distance. The garden terrace is framed by a balustrade of antique statues, one of which depicts the Roman goddess of love, Venus. The composition is dominated by a light colour palette as well as a simple horizontal composition, which subtly underscores the peaceful interaction between man and nature in this Danish summer paradise.